For 16 years, homeowners have chosen vinyl siding more than any other type for their new single-family homes, according to the Vinyl Siding Institute. Value is the reason why. 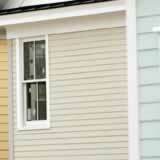 When you choose a type of siding for your home, cost likely will be a factor. That's where vinyl siding moves to the top of the list. Among its many advantageous features is its low cost, in terms of product and installation. Compared to the other siding materials--fiber cement, stucco, wood, brick and stone--vinyl is generally the most affordable. Vinyl siding costs are about $184 per square--$87 per square for materials and $97 per square for labor, according to 2011 data from RSMeans, a company known for its construction costs data. (Keep in mind that one square is equal to about 100 square feet.) In comparison, fiber cement costs about $279 per square, stucco $429, wood $564, brick $924 and stone $1,857. This means vinyl can cost 33 percent less than fiber cement, the siding type with the next lowest price, and 90 percent less than stone, the most expensive. One reason for vinyl siding's affordability compared to some of its competitors is it's easy and quick to install. It also doesn't require the additional cost and labor of painting or staining, like wood, fiber cement and stucco do. If you're remodeling your home and choose to install new vinyl, you can recoup about 72 percent of the cost in increased home value, according to the 2011 "Cost vs. Value Report" by Remodeling Magazine. That's another big advantage.